Blomquist's best finishes on the beach were three third-place finishes in 1997. Blomquist is a 1988 graduate from Connecticut where she lettered in basketball. 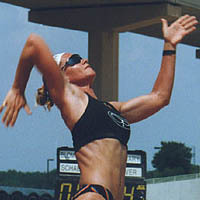 Blomquist was an assistant volleyball coach at Florida Atlantic University before she moved to Southern California to pursue a full-time beach volleyball career. She is married (Stephen Hall).